This question deserves an attention because of the motivation to choose DevOps over Scrum. People want to go with DevOps over Scrum because they want to be agile but they can’t change their organization. Many people in the agile community whom I’ve interacted with think that DevOps is only about toolings for continuous delivery. We’re going to learn why DevOps is not only about tools for delivery pipeline. Unlike my previous article about Scrum and eXtreme Programming, this time we’re going to learn how to integrate Scrum And DevOps starting from DevOps lense. Scrum is just a simple framework for product development based on values. Scrum is highly focused on what is happening during the Sprint. Scrum is an additive framework, which means that Scrum will only tell you the minimum sets on what you need to have, so that you can claim you are using Scrum. Scrum will not tell you how your process will look like within the Sprint. So with this premise, there is nothing wrong with adding additional practices that will enhance the flow of your value delivery on top of the Scrum Framework. DevOps starts from Systems Thinking and view the whole value stream in the system rather than only zooming in development process. Systems Thinking views every interconnected element in a system which affects one another. In a complex system like a corporate, elements do not work in isolation. Making one change in an element is going to impact another in the system. Value stream processing customer requests into a tangible outcome flow from one element to another element in the whole system. Whenever there is a request, there is a value stream. Besides Systems Thinking, DevOps is based on Lean Thinking. Lean Thinking is about reducing waste in the value stream. Waste are non-value added activities. Lean Thinking, Systems Thinking and mapping the whole value stream is important and works with Scrum. In fact, Scrum is based on Lean Thinking. This is what I do before starting Scrum in a large corporate, view the whole system holistically and map the whole value stream in the system. Kanban is a good tool to visualize the whole value stream in the system. When we’re using Scrum and DevOps, all of the activities in the value stream, from customer request to release to production happens within a Sprint. This does not mean a Sprint is a mini-waterfall where deployment only happens at the end of the Sprint and all of the analysis happens at the beginning of the Sprint. Using Scrum with Kanban helps to get out of using Sprint as mini-waterfall. In this article, I am not going to talk about Scrum and Kanban. Scrum Teams applying DevOps Three Ways will have a different way of working to Scrum who is not adopting DevOps. Not only their way of working is different, the team composition is different. Scrum says that the Development Team consists of professionals who deliver the potentially releasable increments. As DevOps views the whole value stream and uses Systems Thinking, the professionals in Scrum Team adopting DevOps are everyone who processes the Product Backlog Item in the whole value stream from end-to-end. This includes everyone, but not limited to, marketing people, analysts, designers, developers, operations people, sysadmins, data scientists and site-reliability engineers. They all work together as one unit to deliver value to their customers. The DevOps Three Ways are the set of underpinning principles that make up DevOps based on Lean Thinking and Systems Thinking. 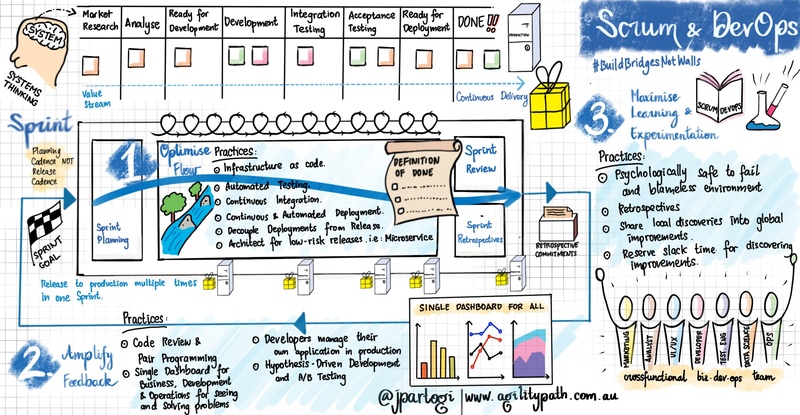 DevOps Three Ways work with Scrum as the Three Ways is not about specific tools and practices, that are often more emphasized during any discussion about DevOps in the communities. Scrum Teams applying DevOps Three Ways will have a different way of working with Scrum who is not applying it. None of the DevOps Three Ways are in conflict with the Scrum Framework and Scrum Values. The practices I elaborate here are not a complete list of practices to implement the DevOps Three Ways.